Q. 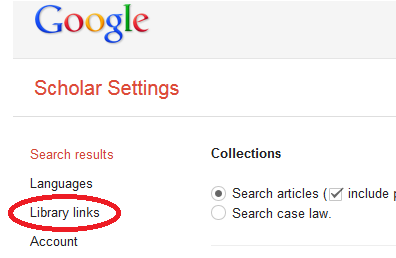 How can I configure Google Scholar off campus in order to see KU Library holdings? 2) Click on the “Settings” link at the top. 3) Click on the “Library Links” at the left. 5) Check the box next to “Khalifa University – Full-Text @ Khalifa Univ” and then save. 6) Now when you search, articles that are available at the KU Library will have a “Full-Text @ KU Library” link next to them.